So, you think you would like to get a Persian kitten? There are many ways to go about getting a Persian kitten. First and foremost, look for a reputable breeder (Click here for what makes a reputable or responsible Persian kitten breeder) and avoid pet stores, etc. Finding the right kitten for you is a process that requires patience. Here are my thoughts for potential kitten buyers on getting a purebred kitten from a responsible Persian cat breeder. 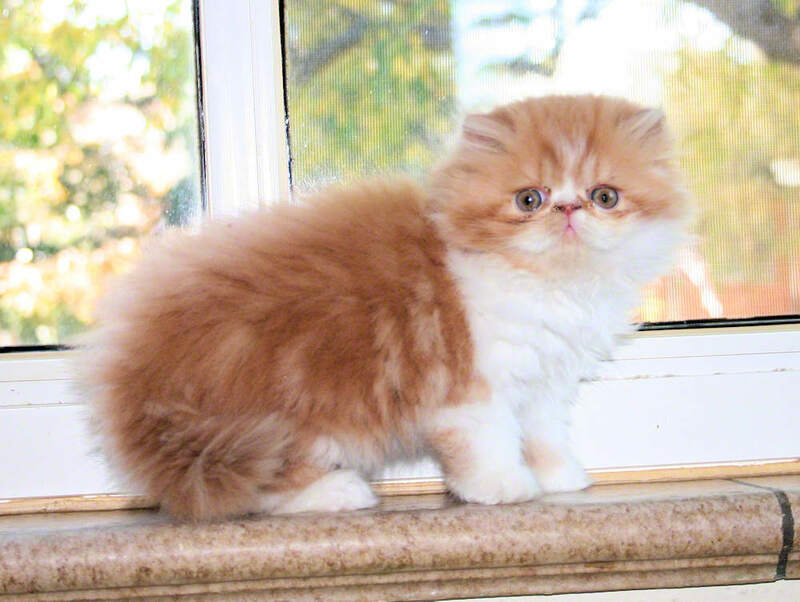 A classic mistake first-time kitten buyers make is: "I need a Persian kitten." So they go out looking for breeders with litters on the ground or due soon. This is not a good idea. Kittens are not interchangeable; one is not the same as the other as every breeder has their criteria for breeding or not breeding. Each breeder has preferences for adherence to the breed standard, health, personality, etc. Breeder A's "perfect kitten" is not the same as Breeder B's. Don't look for a Persian kitten; look for a BREEDER. Make a personal connection with a breeder you feel shares your top criteria and then wait for a kitten from them. Maybe they even have a litter already born, which is wonderful, but maybe the breeder is not planning any more litters for a few months or until next Spring. Or maybe they are not planning anything for a year; in that case, ask for a referral to another breeder that shares those same priorities and has a similar (or just as good) personality and support ethic. Remember, screen the breeder first and then ask about a kitten. It is VERY rare to wait less than a couple of months. The normal waiting time for a kitten is typically four to seven months. I have waited a year or more on a few occasions for a particular color and its adherence to the Persian Breed Standard (pdf file). Nowadays, most responsible Persian kitten breeders utilize an "Application" form which asks many questions about you, your home life, what you expect in a kitten, your knowledge about the Persian breed, housing and care of the kitten and much more. If an application is not required by the breeder you have chosen, then send an email that contains information about you, your home, housing and care of the kitten, breed knowledge, etc. When you initiate contact, clearly communicate three things: You are ready for a kitten, you are ready for a kitten of this breed, and you understand what sets this breeder apart from the others, and you share that commitment. Specifically, describe why you want this kitten; be truthful. Hi, my name is X, and I'm writing to inquire about your kittens. I've been doing a lot of research on Persian cats, and I think they are the right breed for me because of [set forth four or more reasons]. I know Persian kittens are a huge commitment and I am planning to [accommodate that in various ways. - list the ways]. I'm contacting you in particular because of your interest in [insert why you are choosing this breeder] which is something I feel is very important and plan to encourage in [state these three or more ways.]" The above example e-mail is the kind that usually gets a quick response. Be aware; sometimes a breeder may be away at a cat show, so it could be a few days before they respond; do not get impatient. Personally, if I get an email or inquiry that says "Do you have any kittens; how much?" I know that person has not visited my website or read the information contained in the pages of our "Placement" section. This is NOT the type of buyer or home I want for my kittens and is typically an impulse buyer who has no concept of what it takes to care for a Persian kitten. There are always differences in prices of Persian kittens. Make sure you know what each breeder is offering with their kitten. For example, our Placement package and health and genetic guarantee are very extensive – these things are taken into consideration when determining a price for a kitten, along with color, adherence to breed standard, time of year and other factors. Sometimes, a very difficult pregnancy, nationally ranked parents, or a C-section resulting in very few live kittens, are all valid reasons a breeder could be asking more and it is reasonable. If there is no real difference from the other breeders except price, think carefully before you buy. Be Willing to be Told "No"
It is a simple fact that a breeder relies on "trust" and connecting with his or her kitten buyers. If the breeder does not trust you or feels you are not the right fit for one of their Persian kittens, they will (and should) refuse to sell you a kitten. That is the way any responsible breeder should conduct themselves. Kittens are not disposable; they are a commitment. PLEASE DO NOT GET ON MORE THAN ONE WAITING LIST unless you have told each breeder that you are on someone else's waiting list. You need to understand we think our kitten buyers are just as in love with our kittens as we are. We are posting pictures, writing up instructions, researching everything from pedigrees to heath issues, all so we can hand off this Persian kitten, this supreme, glorious creature of wonderfulness, with the absolute maximum chance that it will lead a fabulous life with you. Finding out that you had your name on four lists shows that you do not realize that kittens are not packages of lunch meat, where getting one from Safeway is the same as getting one from 7-Eleven. Additionally, once your name is on one of our waitlists, we have begun to turn away other potential kitten buyers and sending them elsewhere. If you then suddenly say, "I got a kitten from someone else," it really makes us a bit grouchy. Just BE HONEST. If someone came to me and said "I'm on a list with So and So, but she's pretty sure she won't have a kitten for me, and I'd love to be considered for one of your kittens, and I'll let you know just as soon as I know." I am fine with that. I understand how this goes. It is not a disaster for me to have a kitten "left over" at 14 weeks because you ended up getting someone else's kitten. If you end a conversation with me saying "Well, this just all sounds wonderful, and I am going to talk it over with my husband, and we will call you about getting on your waiting list," and then you hang up and call the next person on your list, that is not okay with me. If you do not feel like you connect with me, or you want to keep your options open, a very easy way to say it is to ask what other breeders I would recommend. That way I know you are not serious about one of MY kittens (just any Persian kitten) and I will not put your application in my wait list folder. If you are on my waiting list and you decide that you do not want to wait any longer, just call me or email me and tell me you no longer want to wait for a kitten. No problem, I wish you the best of luck and take you off my waitlist; no hard feelings. If, then, you decide you want to get a different kitten, be my guest. Just keep me apprised and let me close off my commitment to you before you open it with another Persian cat breeder. My first responsibility is to the Persian breed. That is why my priority in placing kittens is to show homes because they are the ones that will (if all goes well) use this kitten to keep the Persian breed going. It is not because I like them better than I like you; it is because I have to be extremely careful who I place with them so that they can make breeding decisions with the very best genetic material I can hand them. My second responsibility is to the KITTEN. I will place each kitten where I feel that it has the best chance of success and the optimal environment to thrive. So while I do care, and I will try to take your preferences into account, do not expect to walk into my home and pick whatever kitten you want. And do not expect to be given priority pick because you contacted me first; conversely, do not expect that because you came along late, you somehow will not get a good Persian kitten. I am going to try to do my absolute best to match kittens to owners as objectively as I can, not according to who called first. Once You Get Your Kitten, There Will Only be That Kitten in the World! If you have been sitting around with your fingers crossed saying "Please, the calico, please, I only love calicos," and I say "I really think the black and white kitten is the one for you," you're probably going to feel disappointed. But take the black and white kitten and go sit on the couch, listen to it purr, let her snuggle and rub on you, and realize that she has a really cool white toe on one foot but none of the other feet have white toes, and I guarantee you by the time you're five minutes out of my driveway the black and white kitten will be YOUR Persian kitten. If you err, err on the side of this being a relationship, not a transaction. Try to act the way you would with a good friend, not with an appliance salesman. The ending will be as happy for you as it is happy for us and it will be in the best interests of the kitten.